Launceston Police and Crime | Launceston Then! Prior to 1836 Launceston was Policed by a simple arrangement with four master mechanics being sworn in as special constables, a shoemaker, roper, blacksmith, and carpenter. They were never on duty and were paid a small annual sum which was paid on any case heard by the borough magistrates. 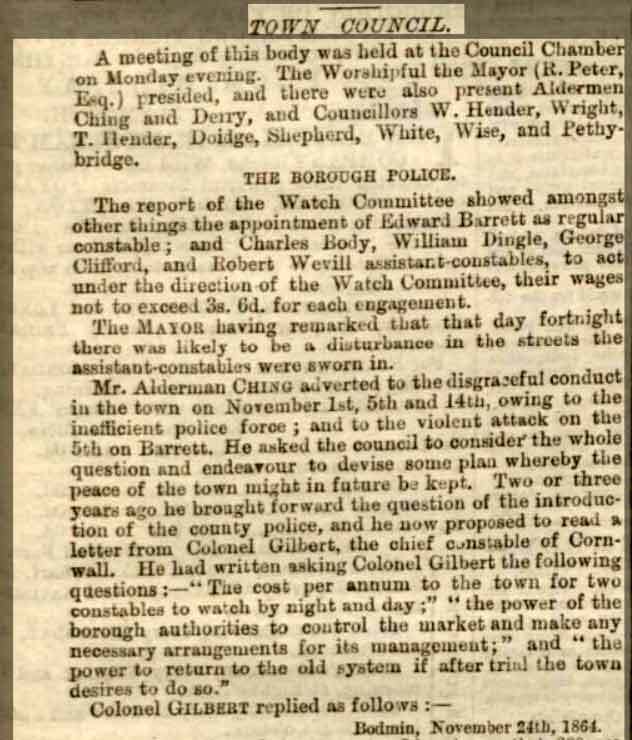 This was not a particularly effective way of keeping the peace and after the winter of 1831 with so many burglaries and other robberies being committed in the town, six watchmen were appointed to be on duty alternative nights. This arrangement only lasted the one winter. It wasn’t until 1846 that the first full time regular Launceston Borough Police officer was appointed, a John Brooming, who was succeeded over the coming years by John Holman, William Caddy and then finally in by Edward Barrett (left). The station was situated by the Southgate (which was later to become the Surgery). 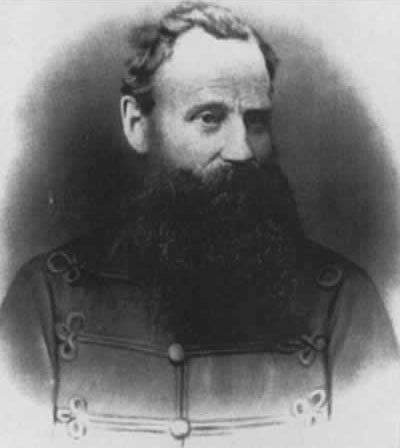 Officer Barrett or Superintendent Barrett as he called himself, operated Launceston as his own little area and would do his level best to keep the county police out of the town. George Orchard wrote in 1932 of remembering Edward Barrett’s stick and dog. “He rarely put on a uniform, but he always had his stick and dog.” He added that as lads “we were more afraid of the dog than we were of Barrett, but on Saturdays and special days the police force was augmented by two ‘specials, and they would always be on duty on Saturday nights. They were Robert Weevil, the saddler, and Mr. Larkworthy. I can see them now as they walked up and down the streets on Saturday night with a badge on their arms. At Newport, residing in the house now occupied by Mr. Bate, resided Sergeant Sherston, in charge, I believe, of the County Police, as far as my memory serves me.” John Dennis reminiscing in 1961 mirrored George’s sentiments “the new fangled County Constabulary was not welcomed in Launceston in the early days, and the first superintendent, Mr. Sherston, had to have his office at Newport, with no jurisdiction over the town.” That was P.O. Barrett’s beat and, as Mr. Dennis recalls, he did have one valuable assistant: his fierce dog, which preceded him wherever he went. “We boys used to fly when we saw that dog coming,” remembers Mr. Dennis of those far off days of nearly ninety years ago. Constable Barrett was also responsible for superintending the market but later a Mr. Brown became market inspector. No 12 Southgate Street the original Borough Police Station. In September 1857 he reported that there was only one constable, but two other men had been “sworn” but had no uniform. He reported that the force had no books, no office, and no records. He considered the force was inefficient and needed more men. The Watch Committee disagreed. Population was 3298. In 1863 The report was in similar vein, The HMI was critical of the cells, prisoners were kept in a tower (The Southgate), up a staircase in poor state of repair, there were two cells divided by a a wall of planks in which there were gaps. In 1877 The format of the report changes. The HMI reports that there was no proper supervision of the force which was directed by the Mayor. The population was 2935 with one uniformed P C and 8 supernumeries who were some time used. In 1881, the last time Launceston is listed as a separate force, there was still only 1 PC, a second man was employed on Saturday and Sunday, but it does not say whether he had a uniform. 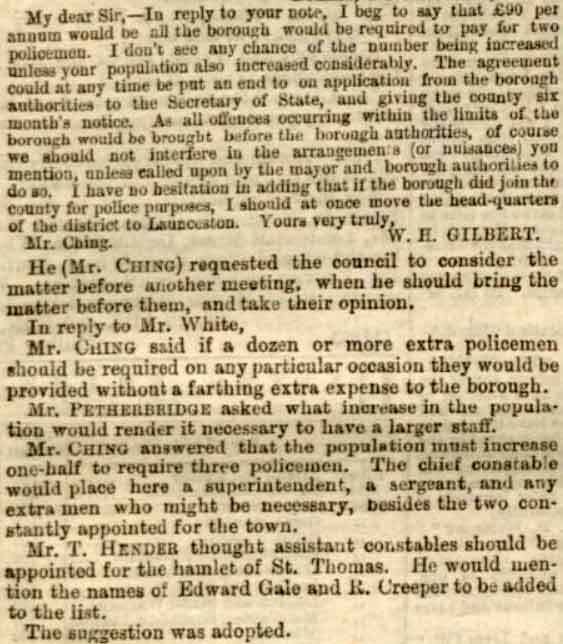 With these continued bad reports and the questionable effectiveness of just one officer for the town, even though he had the assistance of two special constables, the inadequacy of the police establishment and the loss of the Government grant, led to the town council unanimously agreeing to the employing of the county force in the autumn of 1882. Article from the North Devon Journal Novemebr 1864 describing an attack on a clergyman in Launceston. So on the 5th of February 1883 the Borough Police was taken over by the Cornwall Constabulary and Edward, being 60, decided to retire on a full pension. With this take over a new Police station was required. Land was identified at Westgate street and purchased in 1885 for £250 and early the following year tenders were placed for its construction. Mr. Burt of Newport, Launceston was successful with a tender of £1,034. The building (below) was completed and opened by the end of 1886 . 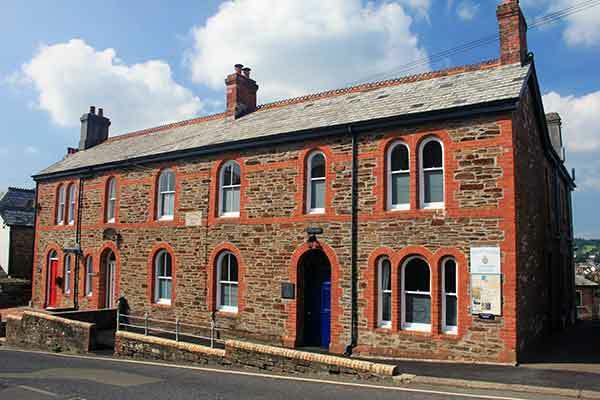 For the next 90 years the building served as the County Police station including from 1967 as the Devon and Cornwall Constabulary until, having outgrown the premises, the force built and moved to the present station at Moorland road in 1977. The building was then sold off and purchased by Peter, Peter and sons solicitors. It is in its third ownership with the Royal British Legion having purchased it in 2013 and renaming it Edymead house. 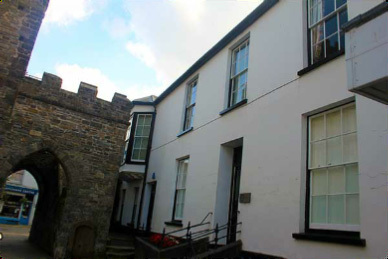 The old Launceston Police Station in Westgate Street. 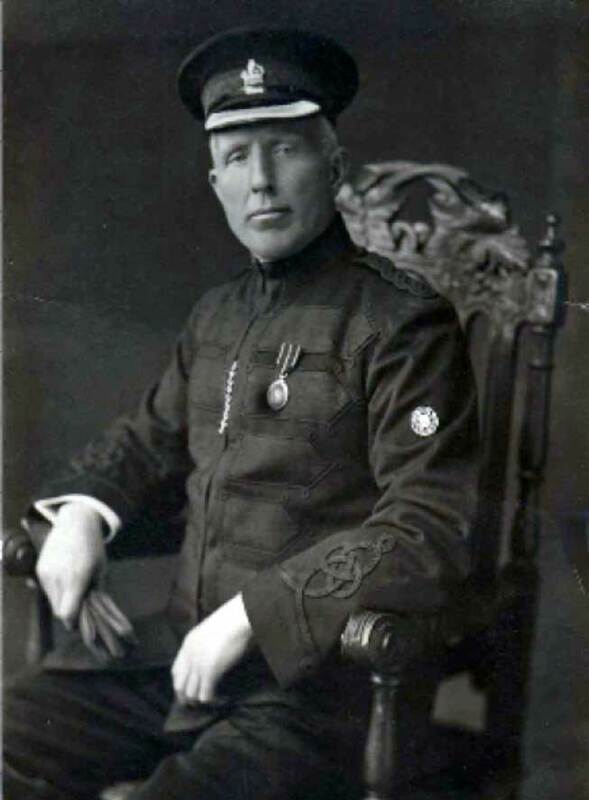 Above Superintendent Alfred Webber, who was in charge of Launceston Police division from 1909 to 1922. 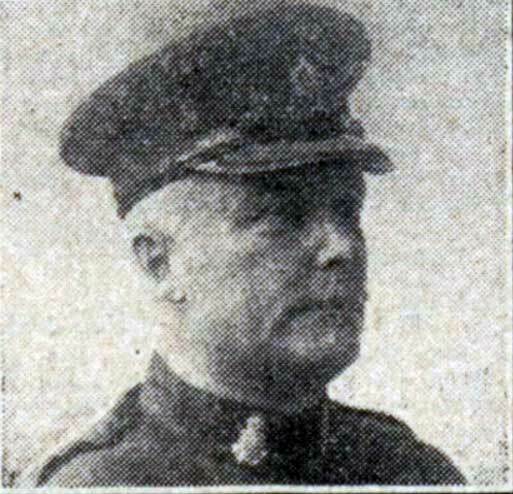 Above Police Sergeant Cleave who retired the same time as Alfred Webber and Alfred’s successor Superintendent W. J. Matthews successor in 1922. 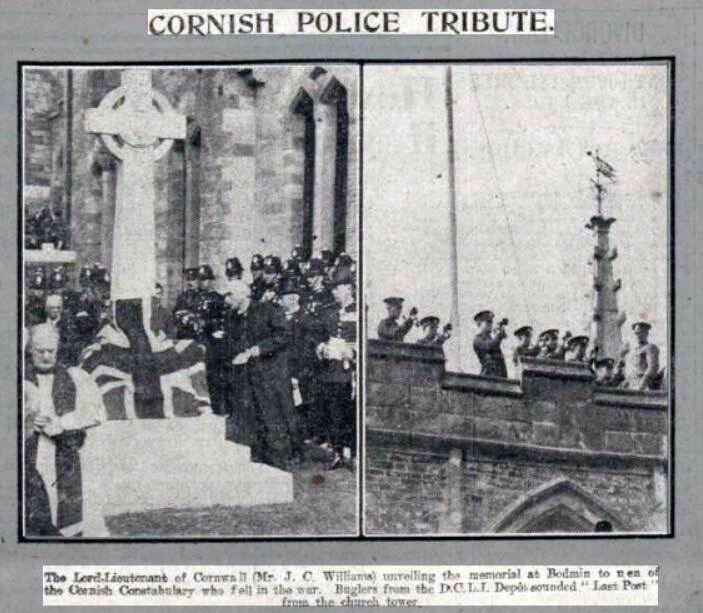 Above is the unveiling and dedication service of the Cornwall Constabulary War Memorial at Bodmin in April 1921. 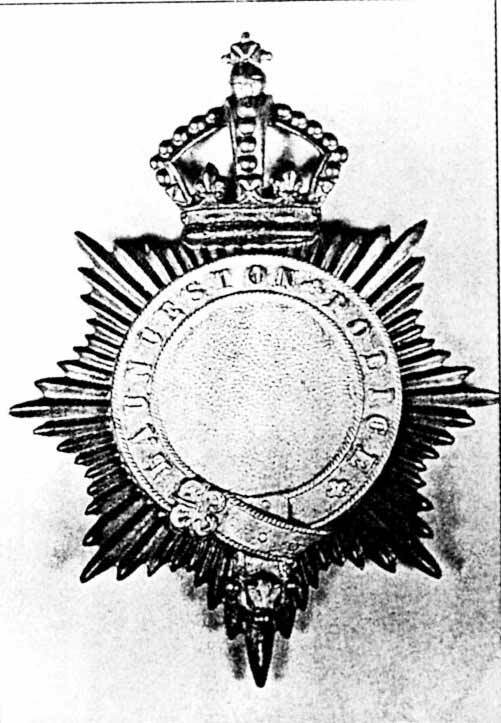 Footnote: The badge to the left is purported to be that of the Launceston Borough Police, however, the authority on helmet badges is the “Kent Simm” collection at New Scotland Yard Museum, and they do not recognise the plate as being from Launceston. The Brunswick star design is too late for it to have come from Launceston Cornwall. It is unlikely that Launceston would have had a helmet to put the plate on as up to 1883 Police Officers wore top hats instead of helmets. It is more likely that the Launceston officers to have had a plain leather in the centre of the badge. Bennetts Arms Death. Higher Bamham Murder. Langore Murder. Public Executions at Launceston. Selina Wadge Trial. Charlotte Dymond Murder. The Trial of Annie Hearn. The Trial of Emma George. The Trial of Henry Spettigue.